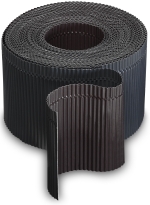 Schneider Color corrugated is a "pleated" flashing panel made of colour-coated lead sheet. The material is applied onto eaves-side connections of roof penetrations to roofing stones and tiles. The finely structured corrugated profile makes it easier to attach it to the appropriate roof cladding. Whether a connection for roof windows, dormers or solar collectors, Schneider Color corrugated is particularly easy to lay and can seal the roof corrugated pattern perfectly. The colour coating is highly UV and weather-resistant, and allows you to choose a colour matching the respective roof landscape. Schneider Color corrugated can be delivered in uni or bi-colour. The material is also particularly durable and 100 % recyclable. Schneider Color corrugated is also available in the designs with "continuous prefabricated bending lines" and "1/3 smooth surface". Further dimensions and colours are available on request.